Ages 6 – 8/9 years, 1st through 2nd grade. 3rd grade may overlap with Pre-Grammar depending on readiness. The 6-9 year old child is socially minded. He is interested in working and learning with others, in learning about the wider world, and in finding his place in it. The Lower Elementary class continues the Montessori foundation begun in Primary and gently introduces students to Classical education. Each morning begins with a work cycle, during which students are responsible for choosing hands-on academic work. The Montessori-trained teacher overseas this work, guiding students into new areas of learning and holding them accountable for using their time well and growing in their skills. Following the Classical model, they begin the study of Latin and World History. Additionally, students are responsible for a small amount of daily homework. Christ is the center of all that we do, thus the prayer table takes a prominent place. The students gather every morning to read the Bible, pray, and sing together. They pray the Angelus at mid-day and leave singing a blessing at the end of the day. Students often choose to pray or worship alone or with a friend at the prayer table. Community building is a key component of Divinum Auxilium, and in particular of the Lower Elementary class where students are learning how to reach out to others. These social students want to work and play together, and are building the communication and social skills necessary to do so in ways which are inclusive. Social skills are addressed throughout the day, but are emphasized during the daily Morning Meeting. Students practice greeting each other, sharing orally (in both spontaneous discussions and more formal prepared presentations), and engage in fun activities together. The children learn to pray in Latin by memorizing basic prayers. They then learn to use Latin together in brief conversations, dialogues, and skits, culminating in the performance of a short play. The memorization required embeds Latin deeply in their minds as a foundation for Latin and English competence for the rest of their lives. Through the use of prepared Montessori materials, students gain a concrete understanding of math concepts such as place value, subtracting fractions, dividing 7-digit numbers, and countless more. As they work with numbers in many ways, using a variety of materials, they begin to find patterns and memorize math facts. 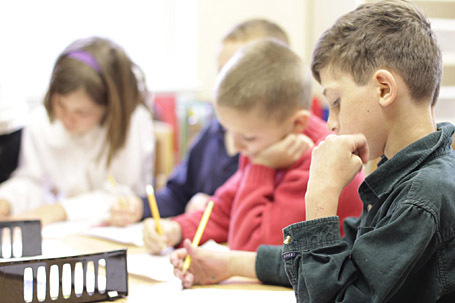 Each student progresses at his or her own pace, guided by the Montessori teacher who follows their interests. Reading is the key skill to be mastered at this age, thus it is practiced throughout each day. Emergent readers meet one-on-one with the teacher to read phonetic Bob books and leveled A-Z readers. Advanced readers meet weekly for a book club, reading and discussing a novel. All students read daily with a partner (rotating pairs through the entire class) and read at home each day. Reading is tied into all of their written work as well. Students read words and sentences before tracing and writing them to practice cursive writing. They read pages from books, songs, or poems before copying them carefully. They read their own writing from their journals to share with the class. Spelling is an essential component of reading and writing. Each student progresses independently through All About Spelling which teaches encoding skills and reliable spelling rules through multisensory strategies. The joy of literature is important, thus the class memorizes and recites poetry and enjoys shared readings of fiction and non-fiction. Students also work with the Montessori grammar symbols to gain an understanding of how words create sentences. All work is completed in cursive and students perfect their cursive writing through daily concentrated practice. Students work with Montessori puzzle maps to learn the continents and countries of the world and the US states. As they work with these materials, they are interested to learn about the history of these places. They learn about Virginia and create a book of maps and information. Once completed, they are encouraged to created books about other states. The study of History focuses on the common needs of people and how these needs have been met in different ways at different times and in different places throughout history. The students are surrounded by science as they explore in the creek, plant and tend crops in the garden, care for the school’s animals, and observe the changing seasons. In a more formal way, the Lower Elementary science curriculum is on a two year rotation: Zoology, with a focus on flying creatures; and Botany. Both topics use Montessori materials as well as Apologia’s scientifically sound and God-honoring series Exploring Creation. 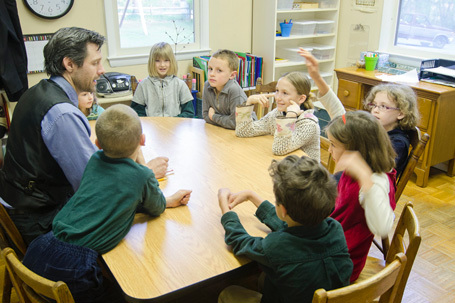 The Catechesis of the Good Shepherd program is both part of and central to the Lower Elementary Class’ overall curriculum. In addition to a dedicated weekly 2 hour Atrium period led by a CGS trained catechist, the students are encouraged to work in the Atrium during their work cycles. All students participate in a variety of age-appropriate subjects in the areas of Fine Arts and Practical Arts. These subjects change and rotate on an annual basis and are taught by professional trade and crafts people. Please see the Enrichment page for more detailed information. To schedule a visit to the school, or to ask further questions, please contact us.